The Sloggi Sensual Fresh Crop Top is a comfortable and supportive slip on top. The new Lycra freshFX forumla enhances the soft microfibre fabric to give you unrivalled all day comfort. The stretch crop top gives you a great shape and the thermo-regulation properties make it perfect during any climate or activity. I'm familiar with purchase, love them and excellent service too! I love this crop top bra! So comfy & my go to bra now. I wear a 34 B so this suits my support needs as I don't need much but still it gives you a better shape than wearing nothing. I don't realise I have it on & I'm planning to use it as a nursing bra too which I think you could definitely do if your small busted like me because it is so flexible. I have the black one. Bought this to wear in bed (don't seem to be able to by verts with inner support anymore) and I'm delighted with it. Comfortable, gentle support, doesn't dig in, slip or create any pressure points. Was a little worried as it's not cotton, but it's cool and soft to wear. I've tried a few bras like this, and this one is the best by far. After my review dated 29th October, Needundies contacted me to say that there has recently been a sizing problem with this item. They kindly sent me a replacement free of charge – size 32. I am delighted that it fits as perfectly as my original size 34! 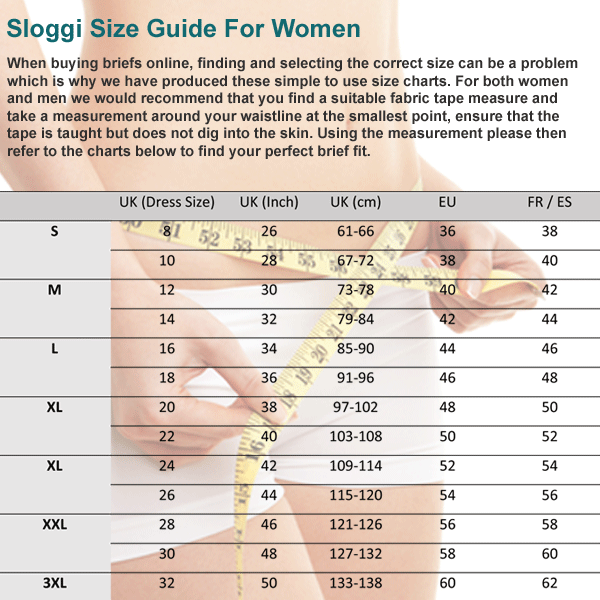 Glad to have helped Jennifer, there has been an issue with incorrect sizing on this particular item from Sloggi but hopefully they have now corrected it! Pleased with product, exactly as seen and described on web.